Special Congregational Meeting on 8/12 @ 8:45 a.m.
Ah, the warm days of summer. There is nothing like sitting under a tree with something cold to drink and reading a good book. It can be relaxing if you can keep the thoughts of work away from your mind. The gospel story of Mary and Martha speaks of this tension between doing and being. Mary sits and listens, thinking and contemplating the words and teachings of Jesus. Martha is busy getting things ready for later in the day. Do we "be" or do we "do?" The answer is complex. Sometimes we need to be "Martha" and sometimes we need to be "Mary." Our society places a high value on being a Martha; working, accomplishing tasks and planning for the future. "Mary’s" are looked upon as not motivated, having their head in the clouds, or being a dreamer. Yet, to be a complete person we need to be both. This means that while you are being a Martha, you need to be completely Martha. When you can be Mary, be Mary. Don’t be one with your body and the other with your mind. During the summer, "do" your work and then leave it behind so you can simply "be." Enjoy the sunshine and the breeze. Summer is too short in the upper Midwest. The chill of the "-ber" months is not far away. Thank you to everyone who has continued to remember the church and your weekly offerings this summer. Summer is traditionally a time when offerings drop off. The bills of the church do not decline during the summer. Vacations and such take money away from the church which makes the summer a difficult time to pay bills. Please remember your weekly offerings even if you will be away from the church for a week or two. You can mail the offering using the offering envelopes or you can drop off your offering at the church. Thanks for being faithful givers. 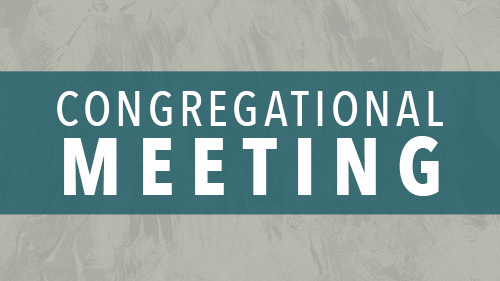 Please plan to attend the Special Congregational Meeting on Sunday, August 12, at 8:45 a.m. to discuss and vote on the shared ministry. When Brayan Geronimo Perez Brito was growing up in Nebaj, a town in the mountains of Guatemala, he felt like he had no future. So at 17, he decided to leave home to find one. His journey brought him to Centreville, Virg., the people of Wellspring United Church of Christ, and the Centreville Labor Resource Center. 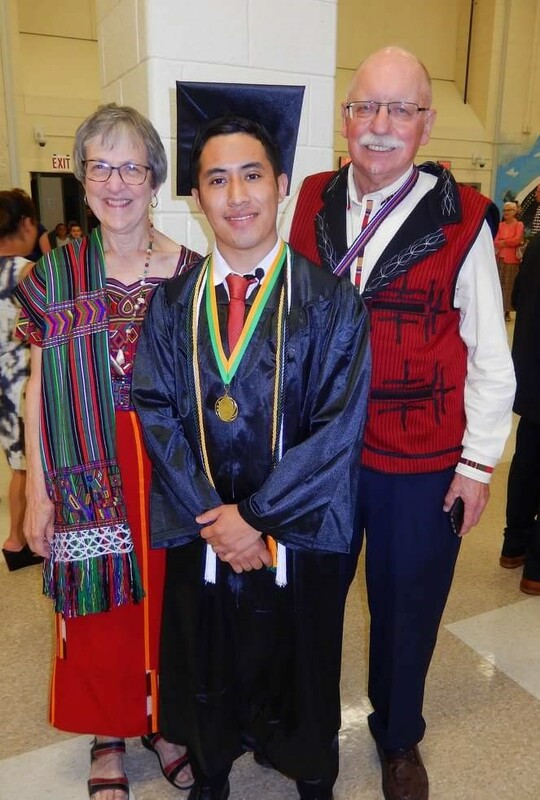 "Brayan has this very strong sense that God has been directing him and making the change in his life possible," said Alice Foltz, one of his benefactors and biggest supporters at Wellspring UCC. "Spiritual strength has been really important to him, to help him get through this journey." Foltz said Brito saw no hope for the future in his indigenous community where, following decades of civil war and discrimination, education does not lead to jobs, schools are crowded and often ill-equipped. Threatened by a relative who had joined a gang, Brito decided to flee to the United States. He walked for 70 days to come across the border with Mexico as an unaccompanied minor. Once in the States, Brito was determined to attend school and began supporting himself. He found the Centreville Labor Resource Center, a non-profit founded by Wellspring UCC. The Center provides a safe place for day laborers to find work, off the street, as they learn English and new job skills. The teenager, connected with jobs and community volunteers, spent four years going to school and working nights and weekends to support himself. After he began to do well, he got a scholarship through the local school district that provided some assistance for living expenses. Brito graduated from Mountain View High School in Centreville on June 12. As a member of Wellspring UCC, Brito translates for the congregation's bilingual services. During worship on Immigrant and Refugee Sunday, June 24, the young man talked about his faith journey: he told the congregation that he is full of questions but feels God's presence surrounding his path. On a recent night he saw an accidental posting on Facebook, an unexpected sign that helped him see all the obstacles he has faced in a different way. Brito said, "Life is much better, realizing that I never was and I never will be alone." Two years ago, as a determined teenager, Brito won his application for asylum and that has smoothed his path through college applications. His goal is to become a scientist – perhaps an astrophysicist to continue the tradition of Mayan scientists who were his ancestors. He has been applying for scholarships, Alice Foltz said, has won Mountain View High's faculty award for academics and leadership, and has been offered a full ride to Shenandoah University. This year, Brito was also awarded the prestigious Senator Harry F. Byrd, Jr., Leadership Award, a $10,000 prize given to the Virginia student who best exemplifies the values of scholarship and service. Brito won this honor through both his academic work and his volunteer contributions at the Center, where he continues to serve on the Center's Directiva. Today the Center is supported by many local churches, individuals, and foundations in the Washington, D.C. metro area. It is a community gathering spot and place of hope for hundreds of immigrant members. With classes in painting, drywall, tiling, the Center also provide a space to meet employers and not experience wage theft. "In 2007 we saw people standing in all kinds of weather, on the street-corners of our suburban community, and this was the beginning," Alice Foltz remembered. She is president of the Centreville Immigration Forum, which sponsors the Labor Resource Center. "At public meetings we heard stories of abuse and mistreatment, and with church and community friends we began looking for ways to help. God was with this project at every step, opening doors when things seemed impossible, and bringing talented volunteers who were just waiting for a chance to make a difference." Brito and about 85% of the members at the Labor Resource Center are from Nebaj, in the highlands of Guatemala. Recently Alice and her husband, the Rev. Jerry Foltz, visited there, and they spent time with families who have not been able to gather for many years. "At Brayan's home, his mother planned a wonderful dinner, with many family members and neighbors participating," Alice said. "We gave and received hugs and blessings, and then carried them home, to deliver across the borders that are so dangerous for most of our friends." Jerry and Alice say they are blessed to serve as a link between people at the Labor Resource Center and loved ones in their homeland. "Everywhere we went, we learned that people left their homes as a last choice, when it was the only way to give their families safety, education and a future." Jerry supports the Center in a number of ways, including accompanying folks to appointments and court dates. "This is part of God's call," he said. "I do what I can to help people find wholeness and health. Everyone is legal and loved in God's world, and everyone deserves a chance." Right now, the Foltzes are housing Brito until he goes to college this fall. "This was part of a call to ministry that has never let us go!" Alice said. "Brayan and the others have made a decision to have faith, and that sense that God is with them, in many cases, keeps them alive. Like everyone, they want a future with safety and opportunity, and with God, they believe this is possible." 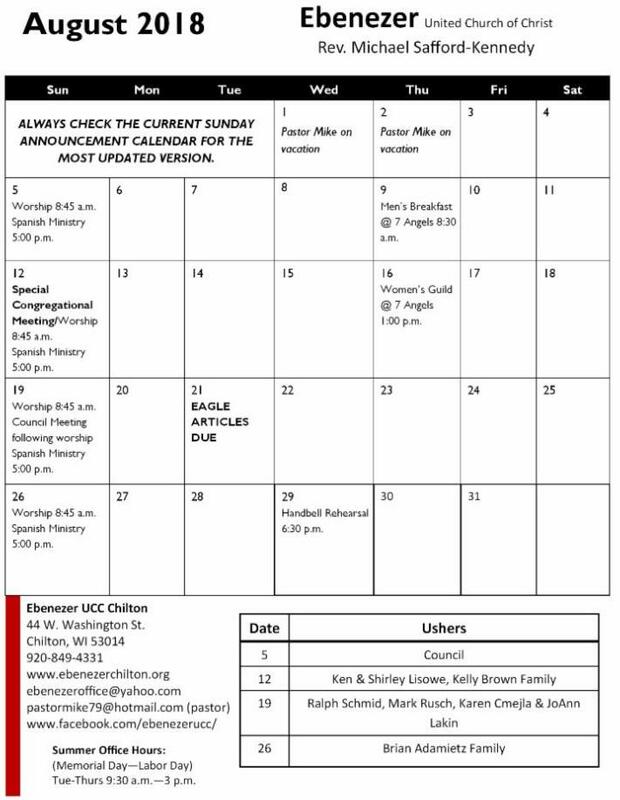 Below is the upcoming ushering schedule; please note that the church office does not find a replacement, but we are happy to help you get in contact with possible subs! Please let the office know when any changes are made. If you have any questions about your ushering duties, click here for the instructions. Edith has put in her resignation as the ushering schedule coordinator; a huge THANK YOU to her for her many years of organizing and recruiting ushers!!!! Ice Cream Social Thank You! Thank you to everyone that helped to make the Ice Cream Social Supper a success - the organizers, poster distributors, lawn sign advertisers, food preparers, grillers, food servers, carryout workers, kitchen/clean-up workers, pie bakers, ice cream scoopers, pie cutters, table decorators, cashiers, and Fellowship Hall & carry-out set-up/take-down helpers (if we’ve missed anyone, we apologize). Also a thank you to anyone who made monetary contributions. We want to especially thank everyone that attended the Ice Cream Social Supper and to those that took carry-outs home. It was great to see the Fellowship Hall filled with church members and guests enjoying themselves, and to see the carry-out workers busy, as well. At this time, we do not have a total of money raised - but will have an amount for next month’s "Eagle!" On behalf of the Ebenezer Women’s Guild, again, thank you everyone for your support! Thank you to everyone who submitted favorite hymn suggestions; the July pre-service sing-alongs were phenomenal! There is such a powerful message in the words and music of our hymns! It was great to have all the voices joined together. Perhaps you would be interested in singing with the St. John chancel choir? Tentatively, they rehearse on Wednesday evening and, beginning in September, will plan on singing once a month at Ebenezer. This would be a great opportunity to combine efforts. Inform Pastor or Elaine if you are interested. Ebenezer Brass handbell choir would also like to encourage ringers, old and new, to join them when they resume rehearsing on August 29. Remember, there is no need for prior music experience to be a part of the bell choir. Contact Jill at 920-418-1534 or speak with any present bell choir member if you are interested. Thank you to Mark Schubert for enriching the worship music on July 15 with the various recorders he plays. He truly enjoys playing descants with congregational hymns and is very creative. Thank you also to Ann Arbuckle who joined Elaine for a piano – organ duet on July 8. They repeated the duet at St. John that day, and at the 4 p.m. mass at Holy Rosary on Saturday, July 28. Music is such a great median to share!! To continue ‘sharing’ the gospel through music, the Bechtold Family will be participating in our worship service on August 19. They are from Marion, Iowa, and will be in the area for the Gospel Music Fest in Hilbert on August 17 – 18. Four of their eight children join Alan, the father, to sing and play instruments including the acoustic guitar, keyboard, fiddle (violin), banjo, guitar, mandolin, and dobro(?). Mother, Sue, operates the sound system and keeps the group organized. 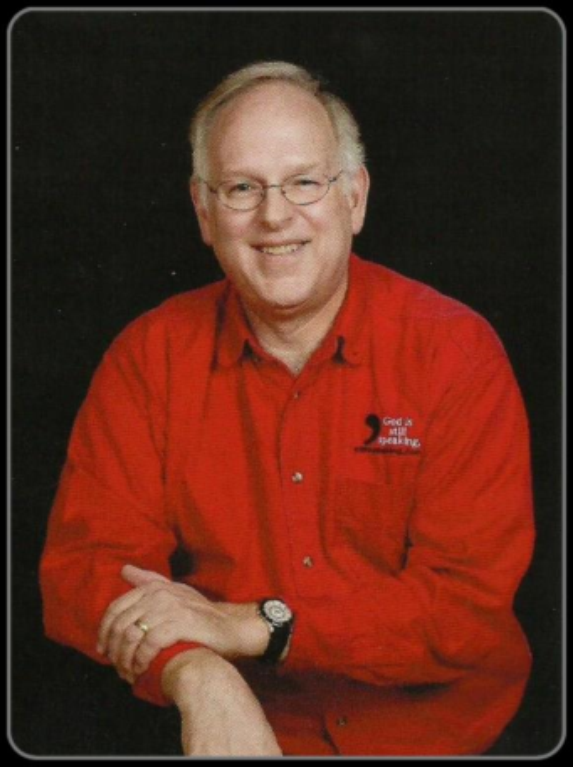 They enjoy sharing their gospel music at nursing homes, fairs, RV parks, prisons and churches. They will be returning from a two-week musical mission in Tanzania, Africa, when they come to our area on August 17 – 19. Please grab a brochure from the table in the narthex for an exciting list of groups that will be at the Gospel Music Fest and be sure to join in Ebenezer worship with the Bechtold Family on August 19! Summer is half over so it won’t be long before the new church season begins starting up again in September with Sunday School, confirmation classes, Handbells and many other things. 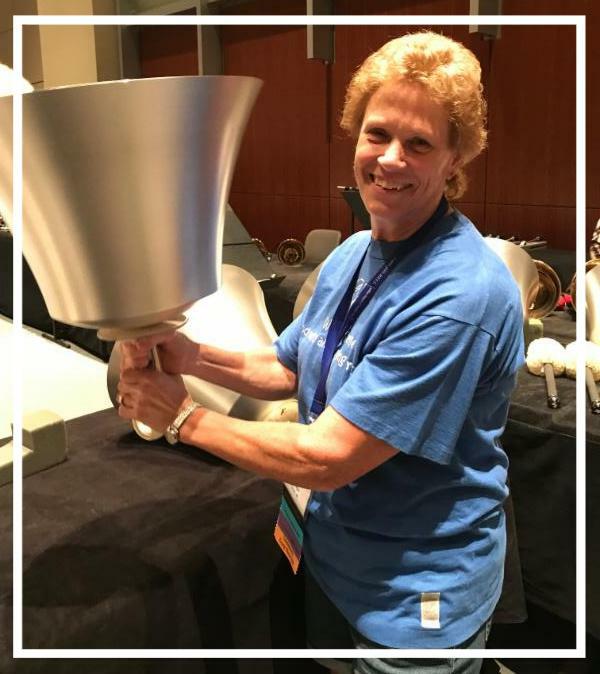 Speaking of Handbells, I’d like to say a little bit about what I experienced at the National Handbell Convention held in Grand Rapids, Michigan, from July 17-21. We stayed at the elegant Amway Grand Plaza Hotel and were treated like royalty with fine dining and meal plans. A statistic we were given was that there were 65 sets of bells and chimes; 390 cases; 2,206+ individual bells/chimes; 1,040 feet foam; from 61 different people/organizations. Replacement value in excess of $1.2M. That’s a lot of work and responsibility to organize all that equipment for a bunch of 500 ding-a-lings!!! LOL! I had the privilege to chaperone Claudia Brown so she could attend the Distinctly Teen group this year. This is a group of young kids from 8th - 12th grade selected to be a part of a handbell choir directed by a renowned instructor, Emily Li, from Hong Kong. Claudia was given Handbell positions, and four pieces of music to purchase and look over before the convention, some of which she had to memorize. 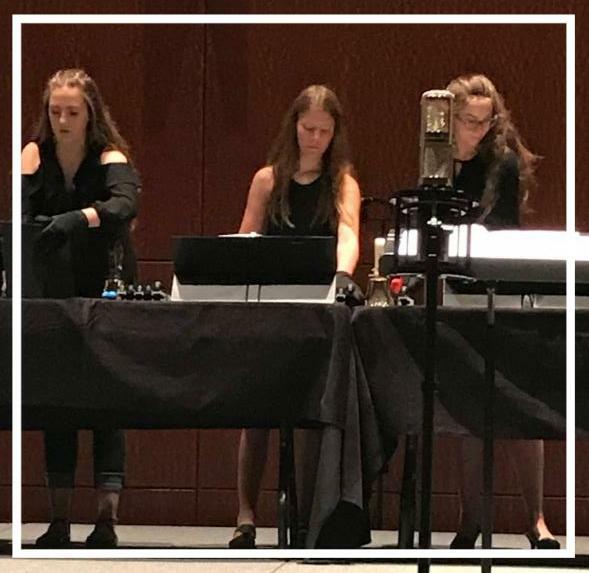 Once she arrived at the convention, the 15 Distinctly Teen members went through several intense sessions of rehearsals and then gave a performance in front of those 500 other Handbell members who attended the convention. This year was the third largest attendance on record at a National Convention. Talk about a little pressure! Claudia really stepped out of her box, as she was required to ring bells she had never rung before! She did a fantastic job!!! When she wasn’t rehearsing, she was able to attend several other class sessions to learn more about the art form of Handbell ringing. I also attended several classes to increase my knowledge of Handbells. Just when you think one knows a lot about Handbells, you realize you only know a small portion and there is so much more to learn! The instructors at all of our classes were so knowledgeable and amazing. Talk about information and brain overload!!! Then every evening, we enjoyed wonderful Handbell performances by some professional community and church groups which were so electrifying and uplifting. I would just like to put it out there for any Handbell ringer who is interested in increasing their knowledge about ringing and the art form of Handbells to please consider going to any kind of Handbell workshop, Handbell Festival, or Handbell Convention offered like this. Claudia and I were so blessed to have this opportunity. The meeting of the Ebenezer Church Council was called to order at 8:07 a.m. by Kelly Brown. Kelly Brown, Kari Meyers, Jamie Plate, Dale Hintz, Pastor Mike and Andy Hofmeister. Colleen Marx and Vern Gasch were absent. Approval of Agenda: Kari Meyers made a motion to approve the agenda. Dale Hintz seconded. Our June revenue was $10,073.28. Our June expenditures were $11,229.39. The Equity as of June 30 was $84,455.64. Our balance as of June 30 was $283,081.39. Kari Meyers made a motion to accept June’s financial reports. Andy Hofmeister seconded. The motion carried. Dale Hintz made a motion to accept the July bill list. Andy Hofmeister seconded. The motion carried. Attendance each Sunday is an averaging of 78 persons. Giving is an average of $1,838 weekly. Pastor will be off for vacation July 30th through August 2, 2018. Christian Education and Music - No new news. Evangelism - No new news. Mission - No new news. Property - Annual walk through of the parsonage will be sometime in July. Stewardship - No new news. Membership - No new news. Braille System Update: No new news. Church Security: The council has contacted some companies for quotes and is still awaiting their response. Shared ministry: St. John council met and scheduled a congregational meeting for August 12, 2018. They are going to recommend continuing with the shared ministry, as is, until their January Annual meeting. Our council also decided to hold a congregational meeting to discuss continuing with the Shared Ministry. This congregational meeting will be August 12, 2018, at the start of service. Spanish Ministry: The council has submitted the 2018 lease agreement for review and signature. Painting the inside of church: Kelly Brown is obtaining quotes to repair the damaged wall and to paint the church. Please contact the council with any bids or donations. The council has submitted the 2018 lease agreement for review and signature. It was brought to the council’s attention that a recording of church services would be beneficial to some of our members. A discussion of various options was had and will be investigated. If you or a family member would be interested, please contact the office or a council member. Adjournment: Andy Hofmeister made the motion to adjourn the meeting. Dale Hintz seconded. Meeting was adjourned at 8:46 a.m.
Approved by: The Church council via email. 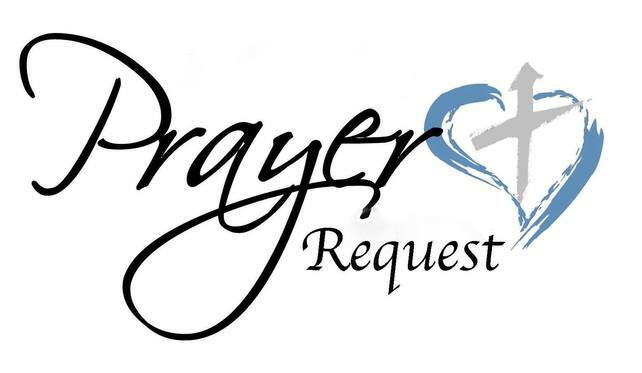 Due to privacy laws, last names cannot be printed on the prayer list because the Eagle goes on the church website which can be viewed by anyone on the Internet. If you want someone added or removed, please contact the church office. Thank you. Painting: EUCC is going to be painting the Sanctuary; if you would like to give a donation or know someone that might be interested in this job, please contact a member of the church council. Newsletter Articles are due to the office on the 3rd Tuesday of the month (unless posted otherwise); be sure to check the calendar for the month’s due date. Please also share any pictures for inclusion! Monday 10:00 a.m. - 1:00 p.m.
Tuesday 10:00 a.m. - 1:00 p.m.
Wednesday 10:00 a.m. - 1:00 p.m.
Tuesday 1:00 p.m. - 4:00 p.m.
Wednesday 1:00 p.m. - 4:00 p.m.
Thursday 1:00 p.m. - 4:00 p.m.
We ask that if you would like to meet with Pastor Mike, please call the office before heading over to schedule an appointment. Thank you to Ken & Shirley Lisowe for all their work in cleaning up the smell in Fellowship Hall! May God bless your years and may you continue to bless Ebenezer! The Pre-worship Sing-A-Long has been extended to August 5 due to the overwhelming response of songs; be sure to come early if you’d like to participate! A 2018 Flower Chart has been posted outside the office. Please remember to notify Jackie if you sign up. A pew card for those that give electronically is available for placement in the offering plates on Sunday morning. If you have a potty-trained 3-year-old looking for preschool, check out Happy Hour Nursery School! Grab a flyer if you are interested in the Youth or Adult Summer Quilting Program at St. John UCC! The Calumet County ADRC needs volunteers! The July/August Upper Room devotional guide is available in the Narthex book rack. Help yourself! All unexpired, non-perishable food items are welcome back in the Blessing Box. *When the temperatures are too high, the canned goods will be brought into the office and those in need are welcome to come in during office hours. Mark your calendar for the Voices of Peace Gospel Music Fest August 17 - August 18 at Hilbert Civic Park! 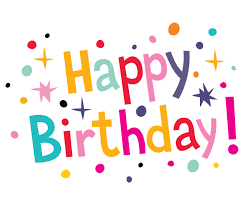 You are invited an an Open House on Sunday August 26 from 10:00 a.m. - noon at St Vincent DePaul Hilbert to celebrate 20 years of serving Calumet county! There will be tours, fellowship, door prizes, and refreshments. Santa’s Best is holding their Christmas Closeout Sale in September; see the flyer on the board for details! Lakeland University has several programs you are welcome to attend this fall! Sunday School: Kickoff is September 9, first day of class is September 16! Follow Ebenezer UCC Chilton on Facebook to be sure you're getting the latest news!